Since 1982, Summit Supply has provided our customers the highest quality products available. The use of the latest technological and engineering advancements has allowed our products to remain at the forefront of the Construction Wear Parts Industry with regard to both quality AND performance. Summit’s proprietary Continuous Steel Cord (CSC) technology has resulted in the elimination of over 95% of all track failures! The result - Our products keep your equipment working longer and more efficiently. Summit Supply isn’t just a “middle man” when it comes to rubber tracks. As a direct importer, with many years of direct factory relationships, we have the final say in what goes into our tracks – as well as what doesn’t! We use a strict blend of 100% natural and synthetic rubber in our tracks, and we never use recycled product. Unfortunately for many customers, our competitors can’t say the same. 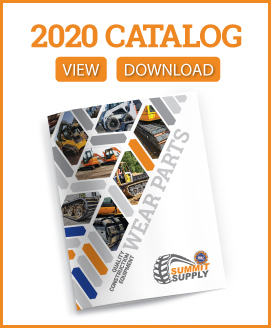 In addition to Rubber Tracks, Summit Supply offers Undercarriage Wear Parts, Solid Tires and Rubber Track pads to fit most popular machines. If you’re unable to find information on your particular equipment, give us a call, and one of our knowledgeable Product Specialists will help you find what’s in stock and available.